If you stumbled across an article entitled Why This Vintage He-Man Action Figure Still Smells Bad 30 Years Later, you'd probably be intrigued for a whole bunch of reasons, particularly if you are old enough to remember the eighties vogue for scented dolls and toys, beginning with Strawberry Shortcake and her equally sweet-smelling pals. The vintage He-Man action figure in question, Stinkor, was made in 1985 and almost three decades later still stinks. Specifically, he stinks of patchouli, which was added to the plastic used to make the toy. Unfortunately, the article doesn't go any further than that, and saying that Stinkor still stinks thirty years later because he contains patchouli is exactly like saying that blood is red because it contains oxygen: it's a literal answer to the question, but it doesn't really answer the question. Elements of perfumery are classified as to their volatility. What we call top notes are like bromine: highly volatile, composed of small molecules, they evaporate almost immediately, so they're the first thing you smell and they're gone quickly. Base notes, on the other hand, are like mercury, composed of large, heavy molecules that evaporate only reluctantly, so they show up late in the perfume's life and last a long time. (Heart notes or mid notes are smack in the middle, neither here nor there.) Fruity notes are almost invariably light and evanescent (although there are chemists' tricks to tie them down for a while longer than usual): patchouli, on the other hand, is a base note and takes a very long time to dissipate. And that is why Strawberry Shortcake lost her scent so quickly while Stinkor still stinks up the place decades later. 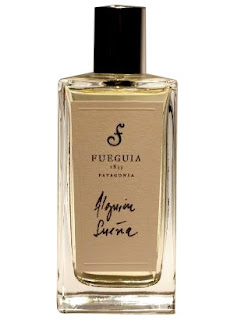 Fueguia 1833 is a new line of 18 scents, and I expect I'm not alone in thinking that launching 18 scents at one time guarantees that they won't each and every one be a great work of art. It's like releasing 18 novels all at once: even if they all have your name on them, then obviously you didn't write them all yourself, and it's hard to see how you could exercise editorial control over the whole batch, so they're not going to be uniformly excellent. Or maybe it's more like releasing a double album with 18 songs on it: even on that smaller scale, you know there's going to be some filler. Without even smelling them — and I have samples of all 18, so by god I'm going to smell them all — it's a near certainty that there are going to be some duds, or at the very least some also-rans, in the Fueguia 1833 line. The premise of the line is that instead of the time-tested pyramidal structure of classical perfumery, each scent will have a nucleus around which two other main elements orbit. Like Stinkor, Alguien Sueña — the name means "someone is dreaming" — smells largely of patchouli: as it happens, like Strawberry Shortcake it also smells of fruit, in this case cassis, or blackcurrant. (The third element is ylang-ylang, which in this case is vaguely floral but not really identifiable as such, at least not by me.) Consequently, we might call it a member of the fruitchouli family, an amusing and accurate term coined by someone on Now Smell This and much used thereafter. A certain grassy-minty quality which we sometimes find in patchouli keeps the scent from being too boring, and the proportions of the scent do seem to vary slightly from sniff to sniff, so the idea of electrons drifting around a nucleus isn't completely fanciful, but there's no real development at all: it's a solid object, a block of fruitchouli, not particularly offensive but not something I could imagine wearing repeatedly, especially not for the frankly outrageous price of $150 for an ounce, $240 for 100 mL. ** In someone else's kitchen, preferably, because you do not want to be inhaling the vapours of either, ever. ***Specifically, it would take about a year for a half a gram of mercury in a single blob to evaporate completely. You can't tell me that's not an interesting thing to know. After our mind-bending trip to Tokyo last year, Jim and I decided that we were going to go back as soon as we could manage it: we thought about going this year, but that was beyond the reach of our time and money, so we're saving up both and planning to go in the spring of 2015, so we can experience the cherry blossoms and explore Tokyo more thoroughly, in addition to visiting Kyoto and Osaka. Consequently, I am trying to learn Japanese. We tend to think of the ability to communicate as a single unified skill. As a child, you learn to speak and understand what's spoken to you more or less simultaneously, and you do it effortlessly, as if the brain had evolved for the express purpose of making that possible, which you could argue it has. Not too long after that, and with a little more struggle, you learn to read and to produce written text that others can read — speech made permanent. It all happens so close together in time that we just think those four elements of literacy and communication are the four faces of the same shiny object, the capstone of humanity. But I have slammed into the fact that those four abilities are at best tenuously connected to one another. It's one thing to look at あ and learn that it stands for the letter "a", or more precisely the sound "ah": these things are not crushingly hard to memorize (although there are a lot of them — two different, barely related syllabaries, each representing the same seventy-odd sounds, plus a collection of thousands of Chinese characters which, perversely, represent the very same sounds singly or in combination). It's something else entirely to be asked to reproduce the character that stands for any given sound. Not more difficult, necessarily (although I think it is): just a different skill. And it's far easier to understand a spoken language than it is to actually produce that language as speech. When listening, you have the luxury of ignoring certain elements, stripping an utterance down to its essentials, and using context to guess at meaning. When speaking, you have to juggle a thousand different things — grammar, syntax, vocabulary — that in your native language you handle without ever thinking about. I've had entire retail conversations with customers asking if we have a certain product and where it's located: they speak French, I speak English, and we get along just fine. I couldn't discuss philosophy, but I could tell them that we have four different kinds of watercolour paper, and which kind of brush they should use on it, because, as Laurie Anderson says, if you can't talk about it, point to it. When in Japan last year, we got by with a lot of pointing to things (and much bowing, along with the words "sumimasen" — "excuse me" — and "arigatou", or "thank you"). * We're hoping to go again in the spring of 2015, and I want that trip to be different. I won't be fluent, god knows, but I want to be able to read signage and have necessary basic conversations with people and understand what's said to me in response. I don't just want to be that tourist. So I am going to learn Japanese, dammit! In Toronto last month we found ourselves in an awe-inspiring little shop called Outer Layer on Queen Street West, and you should visit it if you're ever in the neighbourhood. 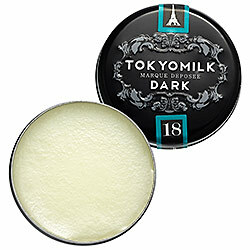 They had a gazillion things, including what I think was the entire Tokyomilk Dark collection. Now, I am unfortunately a lip-balm addict, and apply it, what? thirty times a day? At least. If I don't have some around me all the time I start to go into meltdown. ** Therefore, I am always buying little sticks and tubs of the stuff, and leaving them around where I can get at them. One in a pocket of every jacket I own. One in the knapsack, one in the satchel. At least two at work. Four on my desk in front of me, I see. 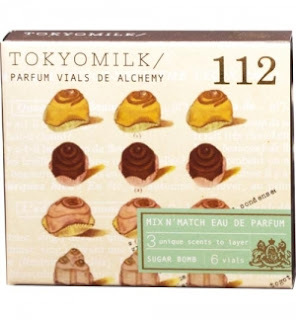 Tokyomilk also makes in their standard line, and Outer Layer also sells, little boxed sets of three scents, two eighth-ounce spray vials of each, that are meant to be worn alone or mixed together. All of the fragrances in all of the sets are at least nominally composed of two notes, although that's just marketing. Most of the scents are very girly and so none of them appealed to me except one: Sugar Bomb. I will always go out of my way to try a dark, sweet scent. You don't expect that fragrances sold with the intention of being mixed will be complex, or even complete: the more elements that are in a scent, the more chances there are that something will clash with another scent. As a consequence, the Sugar Bomb scents aren't really scents at all, but smells, and not even that: they're really bases, the final chapter of a composed perfume. 113 is probably the closest that any in the set come to being a complete fragrance: described as "vanilla orchid and honeyed cocoa", it has a dark orchidaceous floral presence with fruity overtones, making it a fruity floral. It's a stripped-down version of Tom Ford Black Orchid, really, and not bad at all. 114 is a base and just a base: a fragrance with a description of "tonka bean and sweet amber" could hardly be anything else. Consequently, it's a bit cloying on its own. 115, the best of the lot, is described as "sugared crème and fennel", and I guess that will do. It does smell rich and creamy — fatty, in the best way — and wonderfully sweet, with a caramelized-sugar overtone, a slightly grassy anise quality, and a hint of coconut. The packaging suggests the wearer combine these scents with one another, which doesn't strike me as a great idea: base plus base equals more base. (Also, these combos are supposed to provide "endless fragrance pairings", which suggests that someone can't do math.) 113+114 = "oh-so-sweet" (no argument from me), 114+115 = "tempting", 113+115 = "sinful", and all three added together = "irresistible". I would imagine it would = instant death, though I don't intend to perform the experiment. However, any of these three would serve as a good anchor for a light, evanescent fragrance. Test-drive the combination first. *When we got there and were unpacking, I looked everywhere for the phrasebook we had bought, and couldn't find it, because in fact I had left it on the kitchen table. **Speaking of which: I once and only once left a tube of lip balm in the pocket of a pair of pants, and laundered those pants. And ended up with grease stains all over, well, pretty much every article of clothing I owned. And had to get them all dry-cleaned. At least it was cheaper than buying all new clothing. ***The regular line of course also has a line of fortunately unshiny lip balms, and of course I also have two of those: Let Them Eat Cake, a coconut-vanilla concoction, and Rose Water, a sugared rose, both creamier and less waxy than the Dark elixirs and very nice indeed. I've been back for weeks, but it was hard to work up enough of a head of steam to write about scents. There have been entire days when I didn't even bother to wear one, which is a new and unwelcome development. Since I last posted, the lilacs bloomed and are gone, the earth has turned on its axis forty times, and manufacturers have launched another hundred and fifty or so fragrances: if that last fact isn't reason for true despair then I don't know what is. For Mother's Day I took my mom out to lunch — not on Mother's Day, but the day before, because you know on the second Sunday of May every restaurant is packed from brunch 'til close — and bought her some things I knew she'd like: chocolates, a jar of pricey(ish) face cream, and a bottle of her favourite fragrance, Dior Addict. I knew she'd like those things because she picked them out: then I paid for them and had the cashier wrap the Dior so Mom would have the pleasure of opening it the next day. I bet your moms do this: she slid a fingernail under a piece of tape on the wrapping so she could carefully open the package and then save the paper. I said, "Mom. You don't need to save the paper. Just rip it open. Rip it to shreds." She looked at me. "JUST DO IT!" I said, and she did. And after she had, I said, "You've never done that before in your life, have you?" And she hadn't. But she enjoyed it. I naturally got the cashier to toss in a couple of samples: they turned out to be Something Sweet, the newest from Canadian cosmetics queen Lise Watier, and Adam Levine for Men, and you don't need me to tell you that they were both utterly dreadful, do you? After visiting with Mom, I went to Toronto, where Jim flew up to meet me and we spent nearly a week doing most everything we could think of. We went to three operas, we saw a passel of movies, we spent time with our friends Ralph and Ansuya, and we did some shopping — but not for scents, which, in case it hasn't become clear, have started to lose their lustre. Of those hundred and fifty or so scents that have been launched in the last six weeks, there are surely at least a few that are worth sniffing: but most of those are not going to be anywhere that I can get my hands on them. The odds that I would stumble across something wonderful are not good, and they're getting worse all the time: more and more scents, from an ever more restricted palette of ingredients, marketed to an ever more undiscerning population. Hence my despair. But I'll get over it. I have dozens of Luckyscent samples to try: maybe one or two of them will be up to scratch. It could happen! Comme des Garçons scents, as a pretty good rule, revel in modernity, flaunt it: they're more interested in being extreme than in being attractive. The original CdG scent, launched in 1994, was violently spicy and in no way beautiful, though of course it had its fans and is still in production. CdG has produced entire lines of scents that were meant to be off-puttingly modern: their Odeur 53 and Odeur 71 are deliberately synthetic (boasting wacky, improbable notes such as Dust on a Light Bulb and Photocopier Toner), and those were basically trial runs for the five-part Synthetic collection, now discontinued. Even their florals like Carnation and Rose have a certain attack-dog quality to them: they're poles apart from department-store florals. On the other hand, sometimes you actually do get what it says on the package. Bulgari Black, Perry Ellis 360 Degrees Black, and Tom Ford Black Orchid hit the mark, smelling respectively of black rubber, licorice, and dark vanillic flowers. 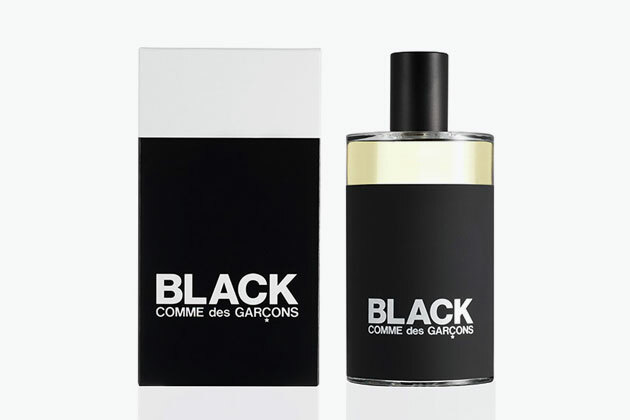 CdG Black has earned its name, too. The top is aggressive, just a little too much too-much: with its pepper-and-petrochemical bite, it suggests tarry scents like Bulgari Black and Goutal's Eau de Fier. After fifteen minutes or so, it settles down into an unexpectedly comforting pairing of black licorice and smoky incense, where it stays for a few hours, gradually succumbing to a base of leathery cedar. It is dark without being oppressive, and the slow crepuscular transition from powerhouse spice to subtle woody leather is a marvellous thing.